After leaving San Francisco, our first stop was Fremont Diner, which was recommended to us by Justin Yu, a James Beard nominated chef at Oxheart, a Houston favorite. When someone who can cook like that tells you where to go, you go there. The wait was 45 minutes, but we had some time so we decided to wait it out. We shared a Mexican chocolate shake while we waited, and it was great - not too rich with just enough cinnamon. And filling. By the time we got a table, we weren't that hungry so we shared a smoked pastrami sandwich with potato salad (the only pic I took was after we had started eating, so I'll spare you). The food was good and I wish we had either had more time or been hungrier, but we had a schedule to stick to! The trailer was in the back seating area (top right) so you could order shakes, beer, or wine while you waited. 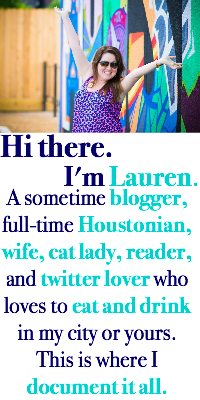 I loved it - it felt like Austin! After lunch, we went from Sonoma Valley over to Napa. 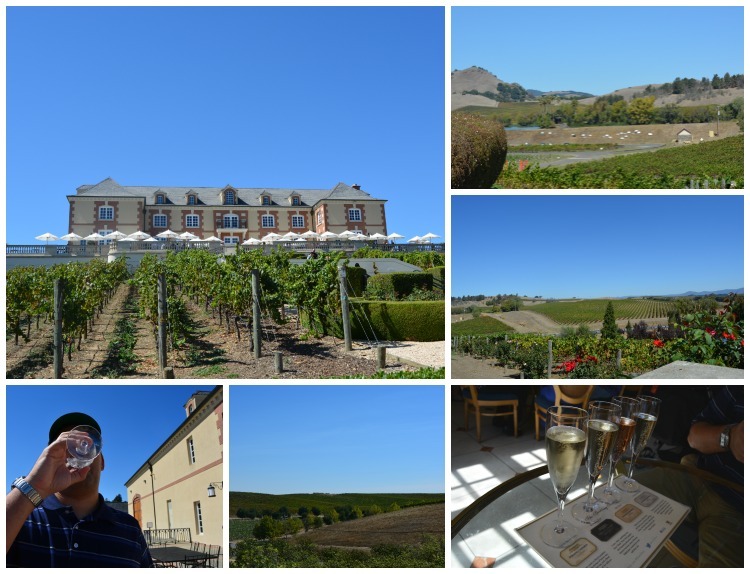 Our first winery stop was Domaine Carneros, known for being pretty and having sparkling wines. I'm not usually a red wine drinker, so Andrew tried to add in as many sparkling stops as he could while he was planning the trip. On this trip, I learned that every winery and tasting experience is different. I think that noting what the experience was like is important because it really affected how I perceived each place, especially once I had many different places to compare. We only did a tasting at Domaine Carneros. We were shown to a table and given a menu, like you would be at a restaurant. Since we were full, we just shared a tasting. The waiter brought out a laminated sheet and four glasses and poured generous portions of the corresponding wine in each glass - easy. He checked on us a few times and answered questions, but wasn't terribly informative. When we were finished, we walked around the tasting room's deck and took a few photos of the gorgeous surroundings, but there wasn't much else to do. On to the next! Oxbow Public Market came up a lot in Andrew's research. It's a large marketplace with restaurants, a bakery, a coffee shop, a produce market, and small shops. 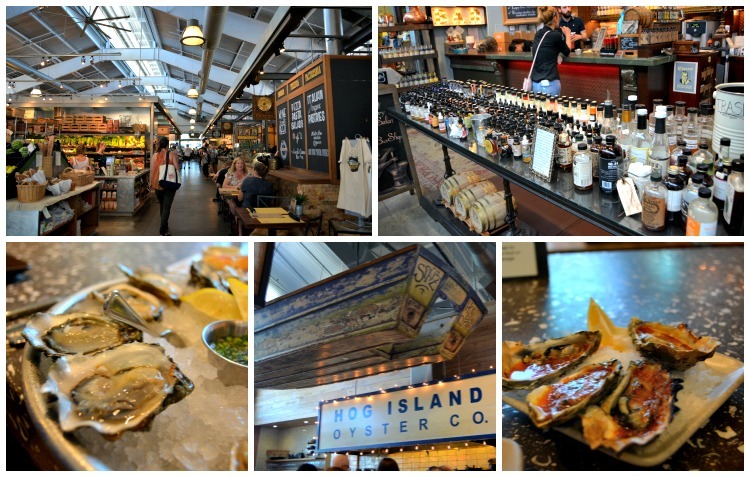 We stopped in to check out the shops and because Hog Island Oyster Depot inside of it is known for having fantastic oysters. I can't really get on board with raw oysters, but I will eat them cooked. Andrew did a tasting of the raw and found a variety he fell in love with. I had some that were grilled and they were delicious. Of course I can't remember what they were, but brown sugar was involved and though it sounds strange, it was great. We checked out the small shops and Andrew had to bring something home from the store that sold nothing but bitters. From the front of the market looking back | all those tiny bottles are different flavors of bitters | Hog Island, raw and cooked. When planning this trip, Andrew kept mentioning cave tours and I wanted to go in any that we could. Something about a cave sounds magical and interesting, right? 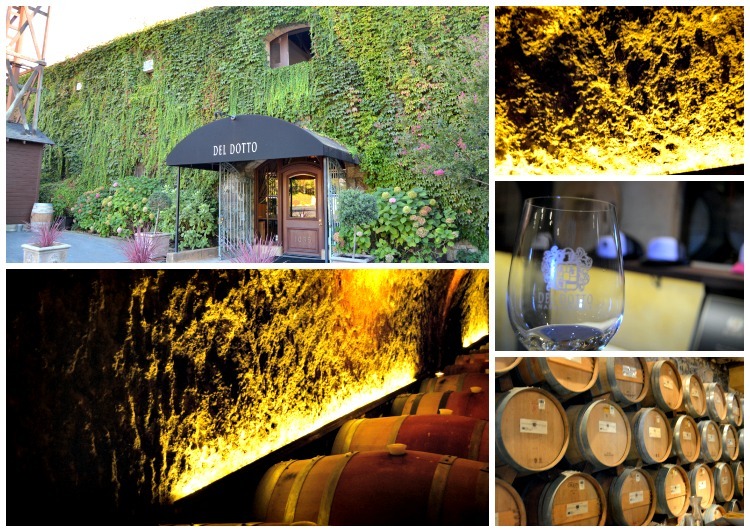 Our first cave tour was at Del Dotto in Napa. Reservations were required and we had to each pay for a tasting. The cave was hand dug before Prohibition began and was much smaller than I expected it to be. This tasting was a barrel tasting, which was a unique experience. The tour guide had a rounded glass tube called a wine thief that she used to take wine straight from the barrel and pour into our glasses. All of the wines were red, but there were a few I enjoyed. We got to taste the same wine - same grapes from the same place, aged the same amount of time - but from barrels made from wood from different countries side by side and the difference was so interesting to me. Did you know that a barrel of wine is about 300 bottles? It seems much smaller to me. The lines on the cave are from chisels. It was dark inside but I felt like the candlelight setting on my camera was pretty true to the way the cave was lit. By this time, it was late afternoon so we went to our hotel, the Napa Valley Railway Inn. Andrew chose it for the location - in downtown Yountville - and because it was a cheaper option. Nearby hotels were as high as $850 per night and I am all about treating yourself on vacation, but that's a little crazy. The Inn is mostly made of rail cars converted into hotel rooms, which sounds cute and cozy. The room we got, though, was a permanent building adjacent to the office area. There was no quaint rail car feel inside. A window AC unit ran the whole time, there wasn't enough light, and the bathroom was tiny - a shower stall and a sink with no room on the edge to put anything. We never saw a hotel employee the entire time - our keys were left in a mailbox outside the office - so it was a different experience. The place gets five stars for price and location, but two stars for the actual accommodations. If we had either been there for a shorter amount of time or if there was more to do in the evenings in the area, it wouldn't have mattered as much, but the hotel was the only "eh" spot on an otherwise stellar trip. Standing outside of our room and facing all of the railcar rooms | our room was the top window. This is the view from the parking lot. It looks really quaint but wasn't as cute inside! Speaking of location, Michelin-starred chef Thomas Keller has multiple restaurants in Yountville, all on the same street, and all on the same street as our hotel. 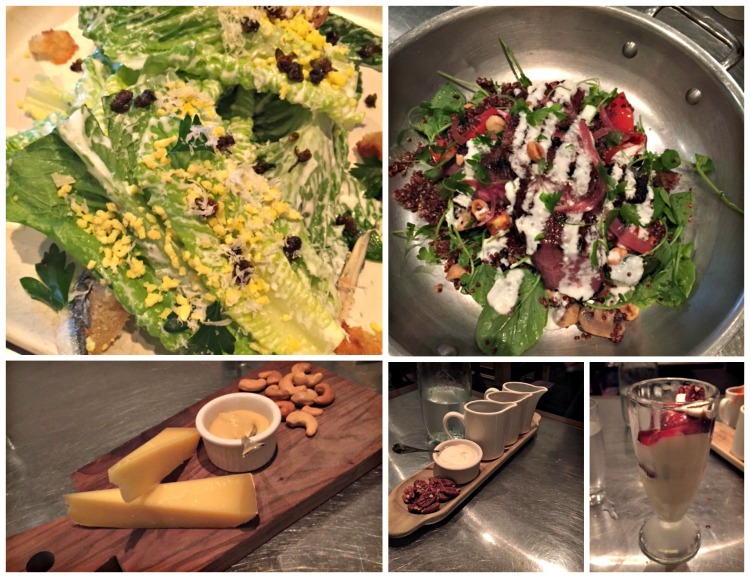 We had dinner plans at Ad Hoc, Keller's mid-priced restaurant that has one menu a night, take it or leave it. Andrew had hoped for his notorious fried chicken, but no such luck. The meal was great anyway. We had a caesar salad (with anchovies, which I ate. I no longer fear them), grilled BBQ hanger steak with quinoa and tomatoes, a cheese course, and sundaes with housemade strawberry sauce, butterscotch, chocolate sauce, toasted pecans, and whipped cream since they always serve sundaes on Sundays. I loved the meal, especially the entree when I was able to get a little bit of everything in each bite. The mustard with the cheese course was a little strong, but the sundaes were a fun and unexpected touch in that kind of environment. Other than restaurants and one bar for the locals, there was really nothing to do each night after dinner. So, after our fantastic dinner at an acclaimed restaurant, we went back to our sad, sad room. It kept us from getting used to feeling too fancy. Who wants to open a sports bar or something like that for tourist with me in Yountville? Did they make the Caesar table-side? I like the idea of a Napa trip but would be unable to do all the tastings. Wine goes right to my head. I do love the Oxbow Market and the diner you hit on the way out of San Fran. The cave tour looks very interesting, and what you learned there IS really interesting. The cave tour sounds like a lot of fun!! I went on one here a few years ago and it was so cool to walk around and get a bit of history with it. The wine tours would be awesome!!! That stinks you guys didn't get a room on one of the train cars. $850 per night is a ridiculous price to pay for a hotel room! Ouch! I would be skipping out on that part too. Overall, what a fun trip!! And some yummy food! Next years girl trip is to Napa. I've been before so I know to expect a quitter trip than normal. That's part of what's appealing though. Good wine all day, fantastic meals at night, chick flicks back in the room and we're asleep.by 9:00. I'm getting all stary eyed just thinking about it. Love, love, love all your pictures!! !